Traditionally, delegates at a General Chapter have an opportunity for an audience with the Holy Father. Often, it is an opportunity to introduce the new general administration to the pope. Unfortunately, Pope Francis was not available for an audience during the July, 2019, General Chapter. Instead, he visited with Dehonians following last Wednesday’s audience. It was the same audience in which a young disabled child endeared himself to the pontiff when he climbed onto the stage and began playing next to the Swiss guard. When the mother tried to retrieve the child she told Pope Francis that the boy was hearing impaired. Click here to view photos from the audience. Fr. 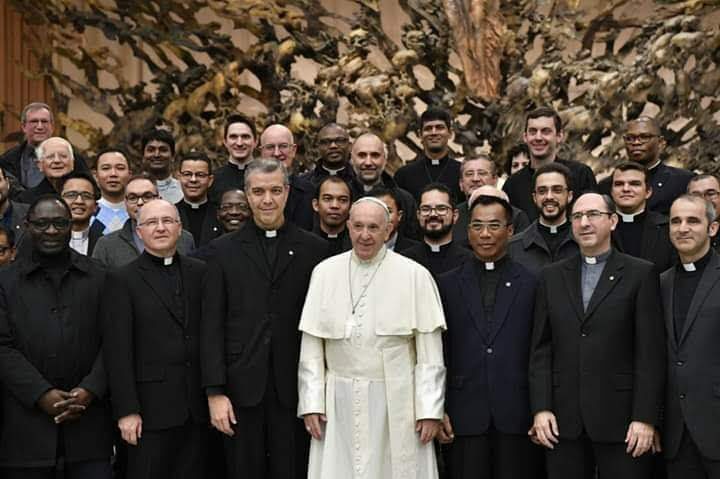 Carlos Luis Suárez Cordorniú, SCJ, superior general, is pictured at the top of the page with Pope Francis. Click here to read AP coverage of the child’s appearance on stage at the audience. During its weekend meeting the Province Admissions Board approved Michael Wodarczyk as a candidate for the Priests of the Sacred Heart. 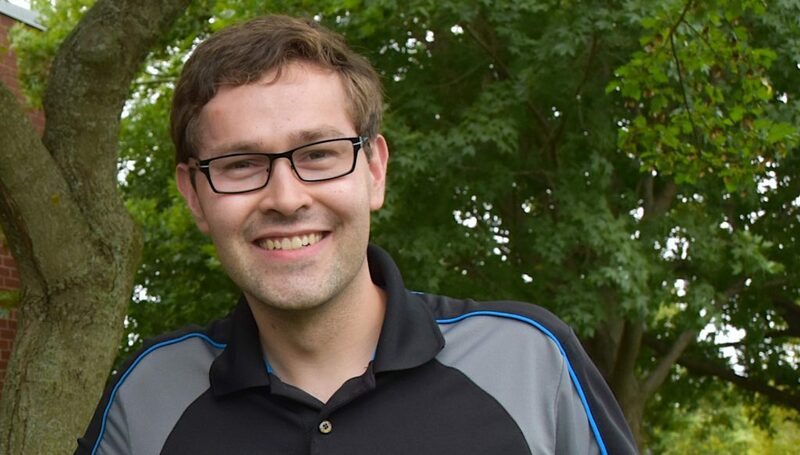 Michael, 30, is from suburban Milwaukee (Brookfield), and has a degree in accounting from St. Norbert’s College. He will join the formation community (pre-theology) at Sacred Heart Monastery in January. Also, Br. Brian thanks people for their prayers and support during his recent hospital stay. He is home and recovering well. Fr. Marcel Ouillon, SCJ, of the Franco-European Province, died November 29. He was born in 1937, professed in 1955 and ordained in 1964. Fr. Tim Gray, SCJ, had a growth removed from his bladder on November 15; he recently learned that it is cancerous. Please keep him in prayer as he begins to look at treatment options. Congratulations to Fr. 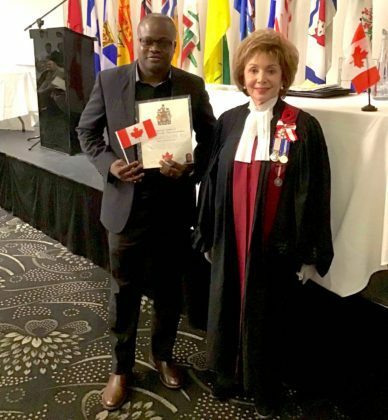 Gustave Lulendo, SCJ, who became a Canadian citizen on November 28. He was among over 300 people from 56 countries to receive their citizenship during a ceremony in Montréal. Originally from the Democratic Republic of Congo, Fr. 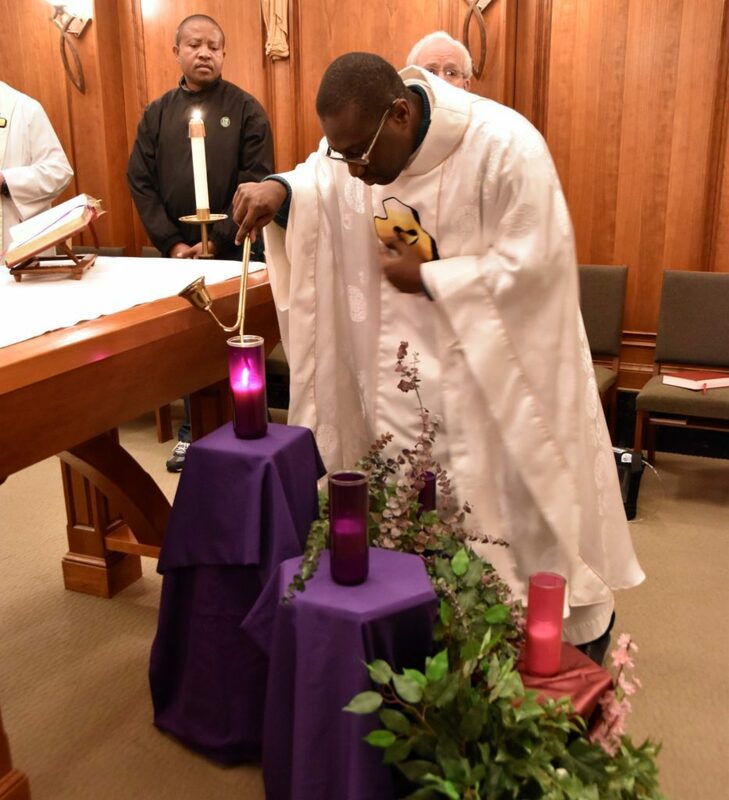 Gustave has studied and ministered in Canada for many years; he is also an alumnus of the ESL program at Sacred Heart Seminary and School of Theology. As noted last week, on January 16, 2019, Fr. Gustave will begin his first term as regional superior of Canada. Click here to view the most recent edition of the JPR News, the e-newsletter published by the US Province Office of Justice, Peace and Reconciliation. This month’s issue includes a suggested action to voice your opinion regarding what has been described as a “wealth test” for potential immigrants to the United States with preference given to those who would not need government assistance during their transition. Following several years of renovations, repairs and updates it might be difficult to remember that the building which currently houses Sacred Heart Seminary and School of Theology, as well as the Sacred Heart Monastery community, is an update of the original monastery. Construction of the new building began in 1966. 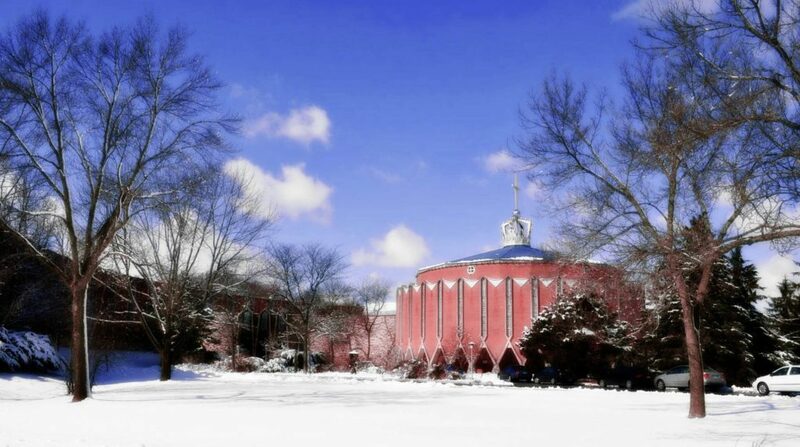 On December 8, 1968 – 50 years ago this coming Saturday – the current structure was dedicated. The original building was across the street, on the property that now hosts Sacred Heart at Monastery Lake, a residential community for SCJs as well as the general public aged 55 or better. 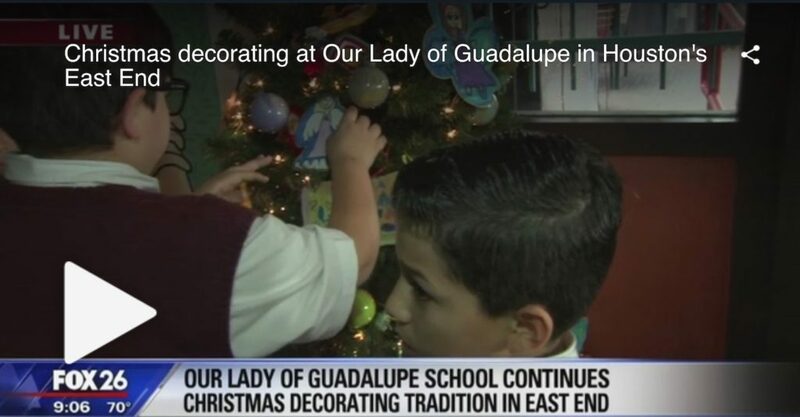 Students at Our Lady of Guadalupe in Houston were featured last week on Fox 26 Morning News Extra. Each year the students decorate the iconic Ninfa’s restaurant with handmade Christmas ornaments. Click here or on the image above to view the video. 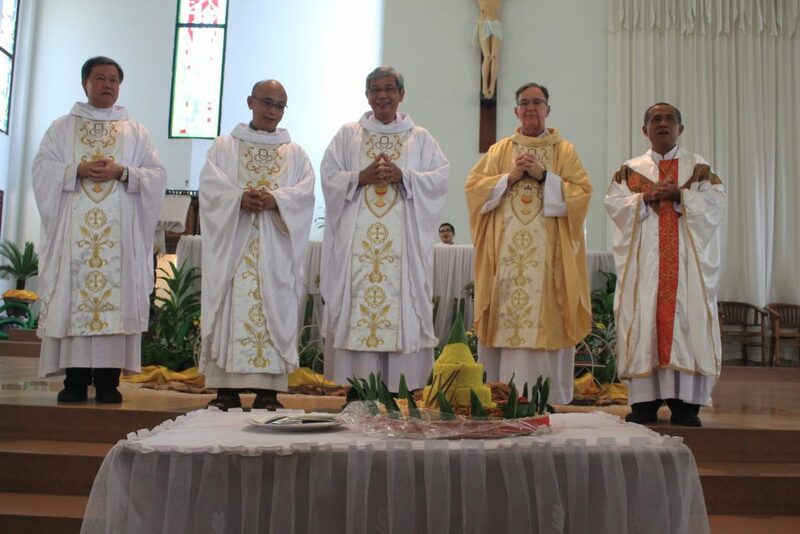 On November 25, the minor seminary of St. Paul in Palembang, Indonesia, hosted an anniversary celebration for four SCJs with strong North American ties: Fr. Aegidius Warsito, Fr. Johanes Juliwan Maslim and Fr. Donatus Kusmartono (25 years of priesthood), and Fr. Mark Fortner (50 years of ordination). Frs. Aegi and Juliwan, originally from Indonesia, are members of the Canadian Region; Fr. Aegi is pastor of St. Thomas More Parish, Scarborough, On in suburban Toronto and Fr. Juliwan is pastor of Toronto’s Indonesian Catholic community, UKI. Fr. Donatus is an alumnus of Sacred Heart Seminary and School of Theology‘s ESL program; he also earned a master’s degree in educational leadership while living with the Sacred Heart Monastery Community (he is now director of the Leo Dehon Education Foundation and superior of the SCJ community in Jakarta). Fr. Mark, a member of the US Province, served as a missionary in Indonesia for many years. This morning members of the formation community at Sacred Heart Monastery lighted the Advent wreath in the community chapel. Click here to view photos from morning prayer and Eucharist. Fr. Juan José Arnaiz Ecker, SCJ, of the Dehon Study Center in Rome shares a reflection on Advent using the writings of Fr. Leo John Dehon. Click here to access it on the general website. Your words of love amaze us all. and at times when we least expect it. and to work for the rebirth of people. may we be ready to welcome you. Prayer from the Community Prayer Book of the Priests of the Sacred Heart.